State Senator Jason Barickman, a Bloomington Republican, will again serve in a leadership role in the Senate. He has been appointed Assistant Republican Leader. 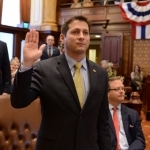 Barickman has served in the Illinois Senate since 2013 after previously serving one term in the House. ‘’Jason Barickman is a dedicated public servant and a proven leader who brings vital experience to the leadership team,’’ said Senate Republican leader Bill Brady. ‘’Our biggest task moving forward is to work with the new administration to find bipartisan agreement on a number of important issues,’’ said Barickman. ‘’I believe we have the team in place to do just that,’’ added the Senator.